The Cubs are still hanging in there, after winning game 5 at Wrigley Field and pushing the World Series to game 6 in Cleveland. The Cubs ended this season with the best record in the league of 103-58, and in usual Cubs manner they are now the underdog in the World Series. But the Chicago Cubs have accomplished so much that they refuse to go quietly, although the possibility of another winless year looms over their heads. 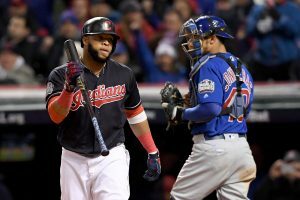 The Cubs avoided elimination on Sunday after beating the Indians in a very close game 3-2, the series now stands at 3-2 in favor of Cleveland. Game 6 will be played at Progressive Field in Cleveland, Ohio this Tuesday at 8:00 PM ET. In game 5 the Indians scored first against John Lester when their third baseman Jose Ramirez scored a single home run in the top of the second. Trevor Bauer looked pretty good at the beginning of the game, but he lost his edge in the bottom of the fourth inning when Kris Bryant scored his solo homer, followed by Anthony Rizzo’s double off the wall in the right field which would culminate in two more runs being scored. The Cubs scored just 3 runs in this game, but after being shut out in game 1 and 3 this was cause for celebration. In baseball, it doesn’t matter by how much you win as long as you win, and the Cubs are grateful for this offensive achievement. This series has been all about defensive plays, although as was expected the Indians offense did a lot of damage in games 1 and 4. In game 5 the Cubs got some great defensive plays from Ben Zobrist in left field and Anthony Rizzo in first, they managed to contain the Indians offense and scrape a win. This season the Cubs have had 17 winning streaks of at least 3 games, can they get a 3-game winning streak in the world series, to even out the series and force it into game 7? There have only been 3 teams in the history of the MLB that have won the World Series after trailing 3-1, these were the 1958 New York Yankees, the 1968 Detroit Tigers and most recently the 1979 Pittsburgh Pirates. Can the 2016 Chicago Cubs join this elite group? Check out the lines on this game and the series at AceSportsbook.com and decide for yourself. Game 6 will pin Jake Arrieta against Josh Tomlin. This will be Arrietta’s 4th postseason start, he contained the Indians in game 2 to just 1 run while striking out 6, he ended the season 11-3 after 15 starts on the road with an ERA of 3.59, making a tough opponent for Cleveland. Tomlin will start after 3 days’ rest and will have the chance to lead his team to their first title in 68 years. Tomlin denied the Cubs any chance of scoring in game 3 and he has only allowed 3 earned runs in his first 3 starts this postseason. History will be made this week at Progressive Field, whichever team wins it will be one for the books, but as good as Arrieta is Cleveland has shown they are stronger in the offensive side. With Tomlin being such a defensive pitcher the chances of the Cubs outscoring the Indians are slim. Cleveland will end their 68-year drought on Tuesday at home.